Oreo is a sandwich cookie consisting of two chocolate disks with a sweet cream filling in between. The version currently sold in the United States is made by the Nabisco division of Mondelēz International. 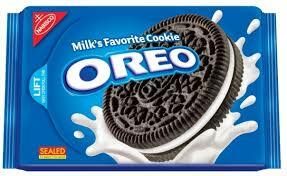 Oreo has become the best selling cookie in the United States since its introduction in 1912.